I love the freedom. As an author, I get full control over the worlds I create and the characters that fill them. I love character creation and the way a character can become a true entity that develops behavior patterns, thoughts, and speech in a way that you know what they would say and how they would act in any situation. These characters become real in a way makes the story happen. There is that instant where you stop creating the story and the story writes itself through the framework you have set. It’s so much fun to see where a story ends up and how the characters grow because of it. I never write with a fully mapped out story. I do outline very basically, but the meat of the story, the details, are as fresh and real for me when I am writing them as they are for the readers. To be involved in each world and to learn the nuances of my characters is so much fun! Deirdra: What is your writing spot like? At the moment, I am writing at the front desk of my husband’s Chiropractic office while I manage the patients, scheduling, and phone calls. That’s my Friday writing spot. On other days, I’m either sitting on the floor in my boys’ room while they play, typing on the bed while they watch ‘Jake and the Neverland Pirates’ or ‘Octonauts’, sitting on a bench at the park while the kids have adventures, or catching a few minutes here or there in the late hours of the evening. I’ll also take my laptop if my daughter has at acting class, while I wait for car oil changes, or I’ll type while the guys are watching sports. I catch any moment I can! Deirdra: Can you tell us a little about your book, Hunter? 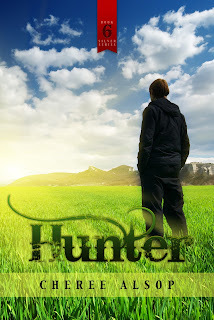 Hunter is the sixth book in the Silver Series. Every book I write contains more of myself than I like to admit, but this one in particular because I grew up in a small farming town much like the one in which Dray grows up. Dray is a werewolf who was adopted before he turned seven, so his human parents had no idea that he was a werewolf. They kept his phasing a secret because they are worried about him being taken away, so Dray grows up feeling very alone and different until a new girl shows up at his school the same time that a pack of wild werewolves starts to kill off the livestock around Thistle. As with all of the Silver Series, Jaze and his team are involved, but more so in this book because Jaze is one of those in danger. The best thing about writing is having others read what you’ve written. It’s been so much fun to hear feedback and to read reviews (which are mostly positive….) about the books. Each book is a new piece of myself that I am putting out there, and all I can hope is that it will be well received. I love to hear that a book really touched someone. I’ve had several people tell me that certain of my books have made them laugh or cry; to know that something I have written has touched someone so deeply means the world to me. Books used to be my escape (and still are on occasion when I have time to pick one up), and to be able to give that to someone else is breathtaking. Life is so inspiring to me. I have three year old twin boys and a ten year old daughter. Every day is an adventure, and their imaginations are amazing; creativity is never-ending at our house! I also ask a lot of ‘what if’ questions, and that spurs so many books I have spreadsheets filled with books ideas. There will be no end to the writing, that’s for certain! I also listen to music. Before I begin a book, I create a playlist that reflects the emotions I want to capture in my book. I listen to that playlist so many times before I’m done writing that everyone in my family is sick of it, but the songs are special to me and relate to specific moments in each book. I couldn’t write without music, or at least my writing would be very bare. My husband. Michael is my inspiration and my motivator. He believes in my writing and encouraging me never to give up. He is my editor and my first reader, and he helps me fill in plot holes and iron out any wrinkles before a book is released. His input is truly priceless! For me, characters come out of situations. In Shadows, Nexa needed to be a strong female who was tough and fearless, yet when she was confronted by someone who actually cared about her, she had to be vulnerable; in Galdoni, Kale wasn’t used to showing weakness because he grew up in a fighting arena where weakness meant death, so putting him in a situation where he was weak brought out the other facets of his character; in the Silver Series, each werewolf stands alone because I wanted each book to show the different sides of being a werewolf. For Dray in Hunter, I saw a werewolf who was adopted young enough that he didn’t know other werewolves existed, making him more alone than all of the others; he has that drive to fit in. He’s a farm boy who feels that there is more out there, but he’s also grown up with good country values like opening the door for a girl and taking care of your neighbor. The characters make the books, in my opinion. You can have an excellent story, but if you don’t have a good character to drive it, it’s just a pretty picture. By the end of a book, I know everything about my character and it’s hard to stop writing them. That’s why the Silver Series turned out the way it did- Jaze and the others have so much more to their stories, and it’s fun to have them in the other books. I am currently working on two more books in my Shadows series, as well as the second Galdoni. There is also a book called Small Town Superhero that should be out the end of next month. It’s different from what I’ve written before and I am very excited to see my readers’ responses to it. Getting published- haha! I’ve received more than 500 rejection letters. I used to keep them in a box, then they outgrew the box and piled up in the drawer. I eventually ‘misplaced’ them and focused on making my writing the strongest it could be so that if I did have the opportunity to be published someday, my work would be something others could truly enjoy. The self-publishing industry has opened so many doors for me. I enjoy the freedom it has given me to write exactly what I want and not be limited by a particular genre or voice. I’ve written dystopian, paranormal, contemporary, and I’m toying with the idea of a western or a regency-era historical fiction, but I’ve got a few series to complete before I start a new genre. For me, the opportunities presented by self-publishing and being able to control both the content and the covers of my books have been priceless. To write as many books as my readers can keep up with. I love writing, and I have been so happy with the self-publishing world and the opportunity I have to get my books to readers who are open and excited to read them. My original goal was to release about a book a month, and last year- the first year I was published- I released 11 books total, so I was able to meet my goal and the response I have received from the books has been outstanding. I will continue to keep up with that pace and I have loved reading the input of my readers. Your emails and reviews inspire me to keep writing. Thank you so much. Write. I have had any people tell me that they have great book ideas and some day they will write a book but they don’t have time at the moment. You can’t afford to lose those ideas. Hold onto them and use them while the feeling is fresh and new. You will never have more time to write than you do right now. That was advice that Robin Hobb, author of the Assassins Apprentice series and many other wonderful series gave to me, and it has inspired me to write in the few short minutes I can grab each day- because eventually it will all add up and you will be glad you used the time you had. Write right now! Thank you. Thank you to my readers for your positive encouragement, for your great reviews, for bombarding me with emails about when the next books will be out, and for anxiously awaiting any news of my projects. Your continued support is priceless to me, and I write for you. Please enjoy because there will be many more books to come! Great interview. Cheree, I love that you create a special playlist for each book. I do the same thing. I love the legend, and have been in love with it since I was a little girl reading about the adventures of Robin and his Merry Men. To read this version of the tale was delightful. To see more info please visit http://essayswriters.org/assignment/.